Other Common Names: Seneca snakeroot, seneka snakeroot, rattlesnake root, mountain flax, milkwort, northern senega, polygala root, Klapperschlangenwurze (German), serpentaria senegalesa (Spanish), polygala de Virginie (French), senegarot (Swedish). Habitat: Senega root is native to North America and can be found from Newfoundland to Alberta in Canada and from New England to Georgia and Arkansas and west to Dakota in the United States. 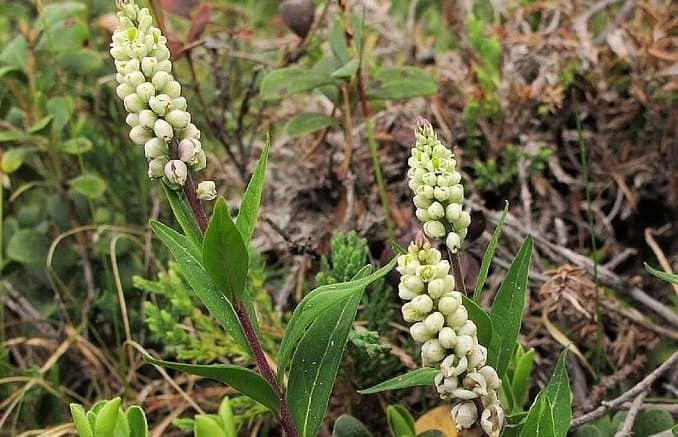 Description: Senega is a perennial plant, belonging to the milkwort family (Polygalaceae), that can grow up to half a meter in height. 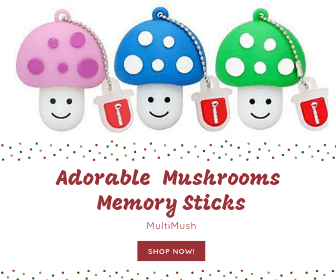 It has green or purple, erect stems and numerous lanceolate bright green leaves. The flowers are greenish white or pale pink and sit in a densely narrow, terminal spike. Senega root consists of a short rhizome and a long sparingly branched primary root that is less than 1 cm in diameter. Plant Parts Used: It is the root and rhizomes that are used in herbal medicine. The root and rhizomes are collected in September and October and dried for later use in decoction, extracts, powders, and tinctures. The roots are mostly collected from the wild, but in some places, cultivation occurs on a limited basis. Senega root has a distinctive odor due to the content of methyl salicylate. 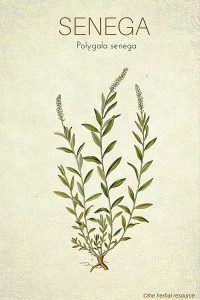 Senega and a Chinese herb called Yuan Zhi (Polygala tenuifolia), a closely related species, contain similar active ingredients but are used differently in Western and Chinese herbal medicine. Active Ingredient and Substances: Senega contains triterpenoid saponins (polygalic acid, senegin), phenolic acids, methyl salicylate, resins, carbohydrates, polygalitol, sterols, and fatty substances. Senega get its name after Seneca people in North America who used the herb as a remedy for rattlesnakes bites. This use is also reflected in one its common name, rattlesnake root. The Senecas chewed the woody root into a wet mass and then applied it directly on the snake bite. There is no evidence that this treatment actually worked. The Senecas also made tea from the root to lower a high fever, treat cardiac problems and asthma. In the year 1735, a Scottish doctor named John Tennent observed that the symptoms of rattlesnake bites were similar to those of pleurisy and advanced stages of pneumonia so he proposed that the herb could be used as a treatment for some respiratory diseases. This application seemed to be successful and in the year 1740 the plant was exported and grown in Europe for this purpose. In modern herbal medicine the root is mostly used as an expectorant remedy for coughs, chronic bronchitis, asthma and whooping cough. The root has a stimulating effect on the bronchial mucosa and helps to expel phlegm from the lungs. The herb’s mode of action has not been studied in any great detail, but it seems that the anti-inflammatory, antitussive and expectorant effects are probably due to the saponins and methyl salicylate. The herb has the general ability to stimulate secretion, which also applies to saliva and sweat secretion. Extracts of the senega root may also be used as a gargle and mouthwash for the treatment of catarrh. Senega root has slowly become one of the more popular expectorant herbs and today it is widely used in herbal teas, lozenges, and various cough mixtures. As a tincture: 1:5 in 60% alcohol. Doses of 1.2 ml three times daily. As a decoction: ½ teaspoon of the dried root in a cup of water and simmer for 5-10 minutes. A common dose is one cup three times a day. Commission E recommends 1½-3 g root per day, 1½-3 ml of liquid extract, or 2½ -7½ ml of tincture daily. For all commercial products containing the herb, the manufacturer’s directions regarding use should be followed. No serious side effects have been associated with the use of senega in small therapeutic doses. Large doses of the herb may irritate the mucous membranes of the stomach and cause vomiting or diarrhea. The herb should generally not be used over an extended period of time. The herb should be avoided during pregnancy and while nursing and it should not be given to children. People with ulcers or duodenal ulcer should not use it. There is a possibility that senega can interact with some medication such as anticoagulants, antidiabetic agents, and antidepressants, therefore anyone taking such drugs should consult a professional healthcare provider prior to use.